While helping companies deal with major algorithm updates, I tend to field a lot of questions. For example, marketing teams, developers, designers, and even c-level executives tend to pepper me with questions about quality updates, Panda, and other disturbances in the Google force. When answering questions about topics like these, it’s great to respond with information directly from Google, when possible. It’s one of the reasons I have a Google archive in my office protected by booby traps, poison darts, and a pressure-sensitive safe that triggers a giant rolling boulder like in Indiana Jones. Hey, I like to be prepared. So, after answering a number of questions over and over, I thought it might be a good idea to write a blog post listing some of the more interesting points. My hope is that this post can help you understand more about major algorithm updates, or that it enables you to pass this information along to your own clients or internal teams. 1. AdSense is NOT the organic side. Actually, the paid and organic sides don’t talk… at all. Well, that would be great if the AdSense team had any impact on, or knowledge of, how the organic side works (which they don’t). And it would be great if the organic side was in tune with the AdSense team, which they aren’t. 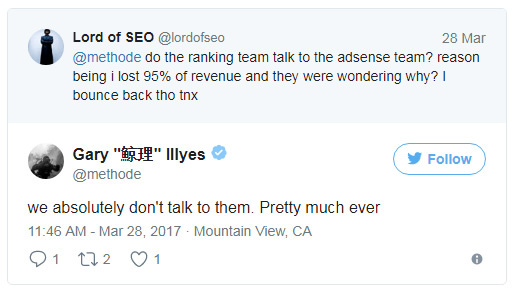 I’ve helped many sites that run AdSense that got hammered by algorithm updates. Actually, I’ve helped a few of the top 20 AdSense earners that got smoked by quality updates. Beware. 2. Impacted by a quality update? Google looks for significant changes over the long-term. If you’ve followed my posts about major algorithm updates, then you know we’ve seen a number of quality updates recently. That’s when Google refreshes its quality algorithms, which could cause serious volatility in the SERPs. It’s not uncommon for me to get calls from companies that have seen drops of 40%+, while also seeing other sites surge. 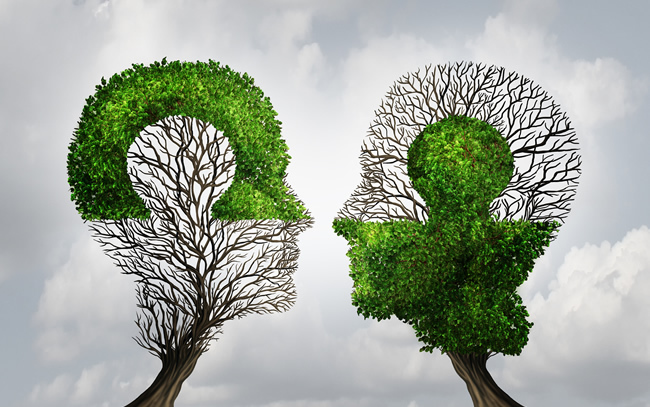 When speaking with companies that have seen negative movement, it’s not long before I get the question, “so what do we need to do in order to recover and how long will it take?” It’s not an easy question to answer, since you need to complete a thorough audit and crawl analysis to surface core quality problems riddling a site. And it’s also never one smoking gun. It’s typically a batter of smoking guns causing problems. And that’s why it’s great to hear Google’s John Mueller respond to that question during webmaster hangouts. John has explained several times how to deal with negative movement due to quality updates. He said Google wants to see significant changes from a quality standpoint, and over the long-term. After helping many companies with algorithmic hits over the years, I completely agree. I’ve rarely seen sites bounce back quickly. Instead, sites need to make big changes in quality and maintain those changes over the long-term to see positive movement. 3. Featured snippets and rich snippets have a quality component. I find many still don’t know this, but both featured snippets and rich snippets have a quality component baked in. 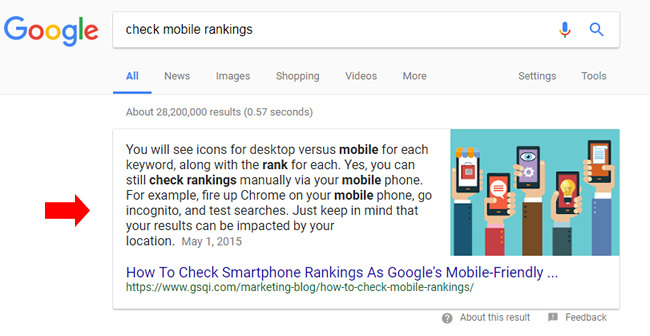 Therefore, if you are impacted by a quality update, then you can absolutely lose (or gain) rich snippets or featured snippets. Also, rich snippets are NOT the same as featured snippets. I’ve heard many people mistakenly use the terms interchangeably. Rich snippets include additional information in the SERP listing and you can use structured data to receive them. For example, rich snippets include star ratings, product information, etc. that are attached to the SERP listing. Featured snippets are algorithmically-selected answers that sit in position 0 (typically above the organic results). They are their own search result and can include paragraphs, images, and tables. By the way, I’m presenting the latest about featured snippets at SMX East next month. Like last year, there’s a lot to cover. I have seen the loss of rich snippets and featured snippets many times while helping companies after they were impacted by a major algorithm update focused on quality. Once again, Google’s John Mueller has explained the quality component several times in the past. And here is a screenshot I posted when writing about major algorithm updates (and the loss or gain of rich snippets). It was clear that the rich snippets algorithm was refreshed during the quality update. 4. QRG is gold. Read it 10X. Google’s Quality Rater Guidelines (QRG) is printed out and bound in my office. I’m not kidding. The QRG is packed with 160 pages of SEO gold. In the QRG, you will find many examples of what Google deems high quality versus low quality, and across various types of websites. 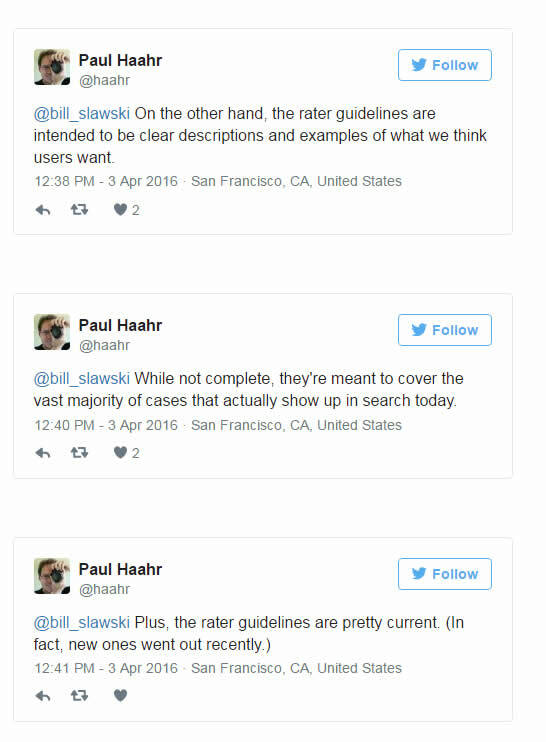 I still find many haven’t read the rater guidelines or internalized the contents, which is CRAZY. You can learn more about the rater guidelines and download the PDF here. If you’re trying to better understand how Google’s quality algorithms work, then you need to look no further than the QRG. Don’t believe me? Maybe you’ll believe Google’s Paul Haahr, a lead ranking engineer at Google (and a veteran Google employee). He’s been at the company since 2002. Yes, read that again. A lead ranking engineer at Google said to read the QRG to see tangible examples of what Google believes users want. I typically send the QRG to new clients to make sure they understand what it is, how human raters evaluate changes to Google’s algorithms, etc. And you should too. 5. Seeing wild fluctuations for certain queries or pages. Convince Google’s quality algorithms! If you’ve ever seen wild fluctuations in rankings for certain queries or pages, then there could be a good reason for that. John Mueller recently explained that it could mean that Google’s quality algorithms are simply not convinced your site is the right result based on the query at hand. John recommended to boost the quality of the page and site in order to cross the quality threshold that would cause those fluctuations to die down. I always think it’s a good idea to review queries leading to your site to make sure your content is meeting or exceeding expectations. I’ve written about this a lot when covering major algorithm updates. Google is always looking to provide the best result for users. Make sure Google’s algorithms understand your content is the best, and by far. 6. All pages indexed count when evaluating quality. When helping hunt down low quality or thin content, I will often surface problematic pages that were published a long time ago. For example, older content from years ago. When bringing this up to companies that have been negatively impacted, some explain that they never took care of those urls since they’re old, and can’t hurt them. That’s not true! Google’s John Mueller has explained several times that all pages indexed will be evaluated when determining “quality” for a site. So those old pages can hurt you. Don’t ignore them… Instead, you should form a plan for properly handling them. That can mean boosting the content quality, noindexing the urls or removing the content (via 404s). 7. Bonus From Me: Massive number of inbound links does not mean you’re safe from algorithm updates. OK, Google didn’t say this. I’m saying it. The reason I can say it is because I’ve helped some extremely powerful sites with massive link profiles that reached out to me after getting crushed by major algorithm updates. Many in the SEO industry are hyper-focused on links believing that the more links you can get, the safer you’ll be from algorithm updates. Sure, it’s smart to build the right links over time, but believe me, they won’t save you from getting hit by a major algorithm update. Again, I’ve helped some companies with incredibly powerful link profiles that got obliterated by major algorithm updates. Their link profiles didn’t save them, and they won’t save your site either. Google’s quality algorithms are simply trying to surface the highest quality content for users based on query. And if a larger site with many links has a lot of quality problems, it can get hit just like any other site. Here are two quick examples based on Majestic data. 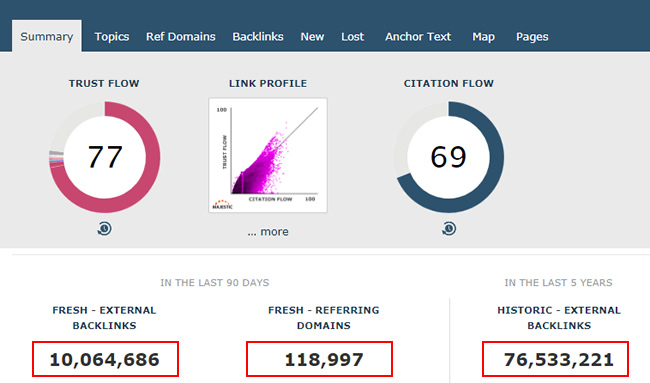 Both sites have been impacted by several Google algorithm updates over the years, yet the first has 28M+ inbound links showing in Majestic’s Fresh Index, from over 170K different domains. 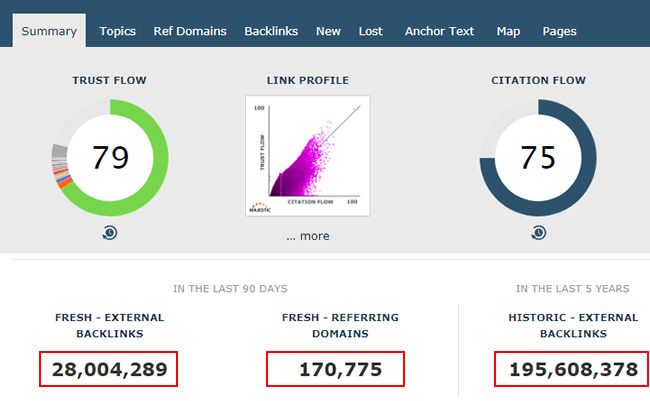 And the second has 10M+ links from over 118K different domains. Summary – Bookmark these quotes. So there you have it. Several quotes from Googlers related to algorithm updates. There’s a good chance you’ll come across questions about these topics in the field, and the quotes I listed above might just help your cause. There are times a solid comment from a Googler can temper even the most aggressive critic. And that can go a long way to helping your clients, company, or agency bounce back from major drops in rankings and traffic.